The Troublesome Trio met again a few weeks ago before we departed for different corners of the world. 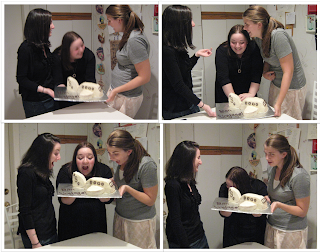 What better way to celebrate than with Airplane Cake? Sarah, Ariel and I (seen before in Cow Cake, Chocolate Ganache Bars and Cupcake Cones) met up before Sarah took a trip to Kazakhstan, (she's since returned) and Ariel went to Copenhagen for the semester (follow her travels at Ariel Abroad), and I....well I stayed in New York. Clearly I'm not well traveled enough to be friends with these two. Which is why I brought cake! After deciding that an airplane cake was the way to go, I spent hours googling other airplane cakes, before deciding on my plan of attack. I've never made a carved cake before, so I was a little nervous. I started with two plain old 9 inch rounds. You can see the recipe I used below. I froze my layers for a while before starting, because it makes all the carving and slicing easier, as well as reduces crumbs when frosting. Oh my god, a naked airplane! This was the first coat of frosting, called a crumb coat. It gets all the possible crumbs stuck down, to prepare it for the second coat. I never quite got the coverage I wanted, even with several coats with refrigeration in between. I probably should have used a better quality frosting (this was canned), plus its harder with white than chocolate or another color. After I was satisfied with the multiple coats. Now, decorating isn't really my thing, although I've been getting more practice at it lately, so I'm sure most of you could do better than my misshapen windows. And this was the better side. Now all that's left is to clean off the cake board! Some people would rather cover the board with strips of parchment paper and pull them out afterwards, but I'd rather have to clean the board then have them in the way. We're really great at posing for pictures. Some may say we have a gift. After spending so much time on a cake, it is sometimes hard to cut into it - but Sarah didn't have that problem! Airplane cake guts. It was delicious. Tip of the Day: If you don't have a cake board that is the size or shape you need, just cut it out from a large piece of cardboard and cover it with heavy duty foil. Just make sure your cardboard is strong enough to hold your cake and won't buckle. Beat together the butter and sugar until light and fluffy. Add in the vanilla. Beat in the eggs, one at a time. Beat in buttermilk (mix will look curdled). Gradually mix in flour, baking powder, baking soda and salt. Divide batter between two parchment paper lined 9 inch round cake pans. Cool in pan ten minutes then invert on to wire rack. Trim the two 9 inch rounds so they are flat and even. Slice one exactly in half, and sandwich the two halves together to create a double layer semi-circle. Trim the top of the semi circle so it is flat. Attach it to your cake board with a dollop of frosting. Cut the remaining round in half as well. Cut one of the halves in half again. Each 1/4 of a cake will be a wing of the cake. Arrange them around the body of the plane, and attach with frosting. Cut a tail shape out of the remaining cake and attach it to the back of the plane with frosting. Cover the whole cake with frosting - you will probably need two layers. Decorate as desired. I almost cried reading this post. The cake was amazing! (And you and Sarah are OK too). I didn't cry. I do not have the ability to cry. Side note #2: GREAT CAKE AMY!! Side note #3: ARIEL, COME BACK TO AMERICA! I WANT MORE PLANE CAKES! Side note #4: There were four people present at that gathering. Thanks, Amy. Just kidding. I'm happy to be designated photographer. But dave theres no alliteration for four people. Let The Troublesome Trio be.